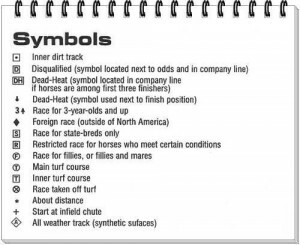 Horse racing handicapping is easier when you understand what Past Performance Symbols mean. 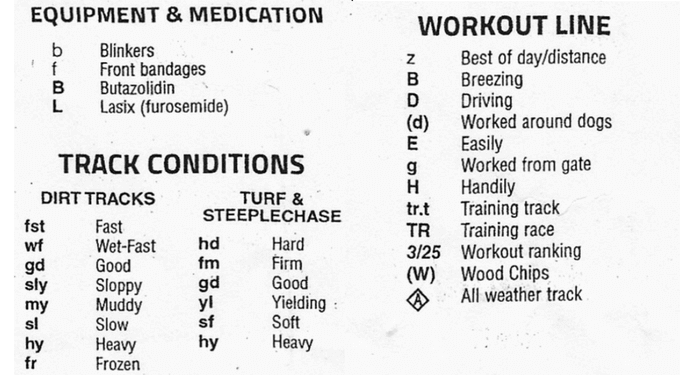 Past Performance Symbols can tell you a lot about the horses running style, equipment, and medication use if any when you understand the symbols. It will also tell you what kind of track the horse has run on (turf, dirt or synthetic) and how well he performs on different surfaces. Within the Past Performance Symbols, it will tell you if there are any equipment changes in the current race, such as if blinkers are on or off. If the horse is now using the medication Lasix for the first time, which could possibly improve their performance. It will show you when and where the last time the horse has raced and the position she/he finished in. These are important factors you should take a look at when trying to decide which horse to place a wager on. First time Lasix can really help the horse perform well in the current race. When the trainers or owners want to change equipment they want to help the horse perform to the best of his/her ability. In the Past Performance results, distances are one of the simplest things to pick out when reviewing a horse’s prior races to the current race. That is one of the key factors to look at when trying to pick out the horse to bet on. Horses that race under one mile (8-Furlongs) are referred to as Sprints. Horses that race over one mile (8-Furlongs or more) are referred to as Routes. It’s always a good idea to check the past performance results to see if a horse prefers a sprint race under 8 furlongs or prefers longer distances over 8 furlongs which are route races. If you plan on going to a Thoroughbred Horse Racing Track in North America any time in your life you will need to learn the language. There are several terms you will need to understand before you go to any race track. For a more in-depth list of horse racing terms, check out DRF Daily Racing Form they provide a completed list.